In 1985, Citizen revolutionized the divers watch with the introduction of Aqualand, the world’s first professional diving watch with depth sensor and display. 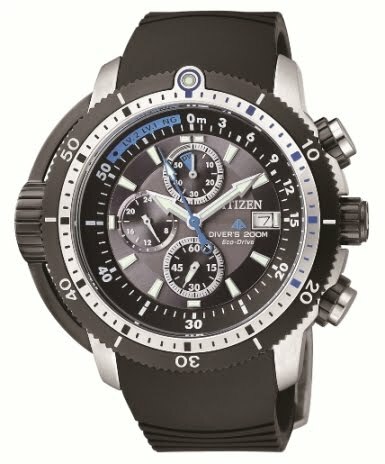 Since then, Citizen has introduced several models in this series which are functional and stylish. Two decades later, Citizen presents the renovated Eco-Drive Super Aqualand BJ2120-07E, the most advanced and stylish Aqualand ever developed. The watch is equipped with special depth sensor which works efficiently under high pressure. It can detect minute changes in water pressure and translate them into precise reading. The watch can display depth up to 50 metres and also indicates maximum depth memory. The super Aqualand features Diamond Like Carbon (DLC) coating on the bezel, crown and depth sensor, providing a smooth finish and elegant tint, with excellent abrasion and resistance. Encased in a stainless steel construction, it is water resistant to 200 meters. The watch also features chronograph function, one-way rotating bezel, screw-in back cover and screw-down crown. Additional features includes, insufficient charge warning and depth alert function. Powered by Eco-Drive movement, ensures precision and reliability, no matter how unforgiving the conditions.